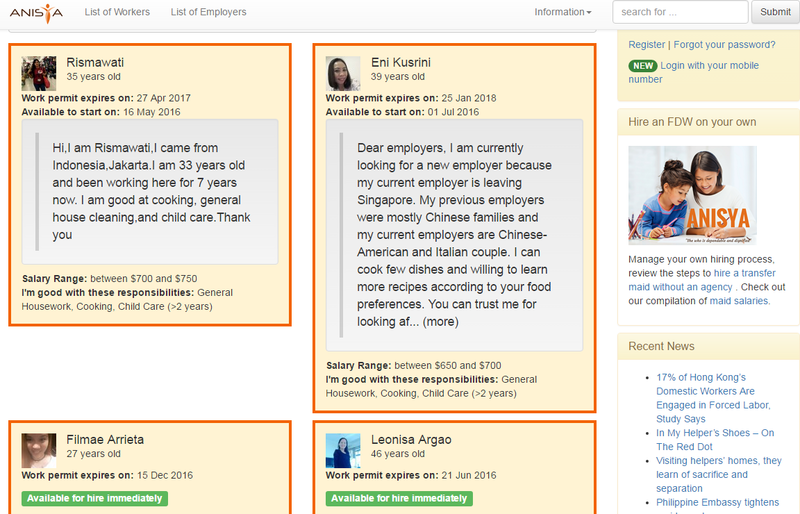 A LinkedIn-style platform for migrant domestic workers seeking new employers in Singapore? It’s already happening. This chemistry was reciprocated: the employers made her a job offer on the spot. 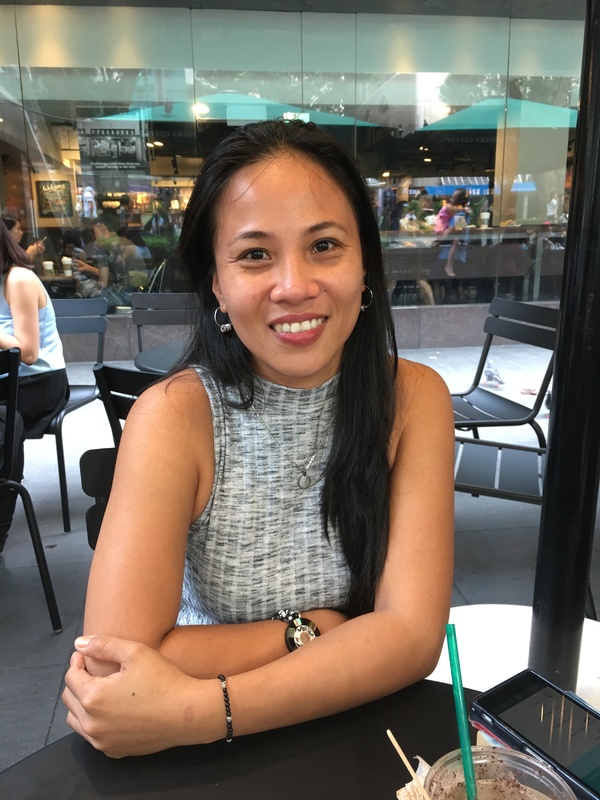 While this scenario is a familiar one, Rowena is slightly different from whom many of us imagine to be someone who independently navigates Singapore’s job-search landscape: she is a Filipino domestic worker who is searching for a new family to not only work for, but also to live with. Rowena Caoile relaxes at a cafe on a Sunday afternoon. Many experienced migrant domestic workers may seek out new employers when their two-year contracts come to an end, but they often engage the services of an employment agent to do so. 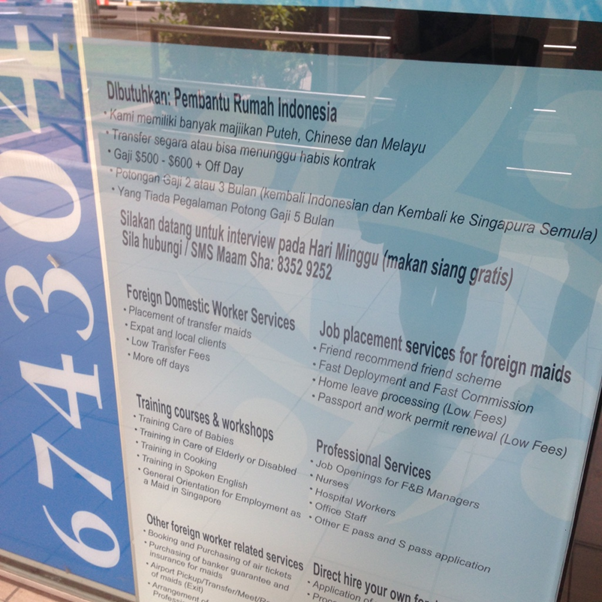 Migrant enclaves such as City Plaza teem with agencies which bring in first-time domestic workers from countries of origin such as Indonesia, Philippines, and Myanmar, but they also help to place domestic workers already in Singapore who are searching for a new family to work with. For some employers, these ‘transfer’ workers are preferred over first-time hires for many reasons: they are often experienced, adept with Singapore’s cultural particularities, may have a better command of English, and are frequently immediately available, without the intervening wait-time of several weeks that comes with hiring a worker still residing in her country of origin. Many employers also prefer the immediacy of a face-to-face interview in order to find the spark of personal chemistry that Rowena talks about feeling. Rowena, however, has taken matters into her own hands by eschewing employment agents entirely. On online platform Anisya, an open employment marketplace for domestic workers and employers in Singapore, she has set up her own job profile, which links to her Work Permit history on the Ministry of Manpower website. From there, she can reach out to employers she thinks she might be a good fit for; alternatively, employers who come across her profile and are interested are able to send her a message requesting for an interview. Rowena grew up in northern Luzon. She comes from a close-knit family of farmers, having spent her childhood planting tobacco and sweet potato, chopping firewood, and caring for buffaloes, goats, and cows. She came to Singapore in 2004 because it was difficult to find a well-paying job in the Philippines, and many jobs were offered only on a short-term, contractual basis. In 2004, she worked for a Singaporean family for nine months before returning home as her father had passed away. She then gave birth to her son in the Philippines and waited until he was older before returning to Singapore in 2010 as a domestic worker. From 2010, she has found jobs with four different families before starting a new contract with her current employers in December 2015. 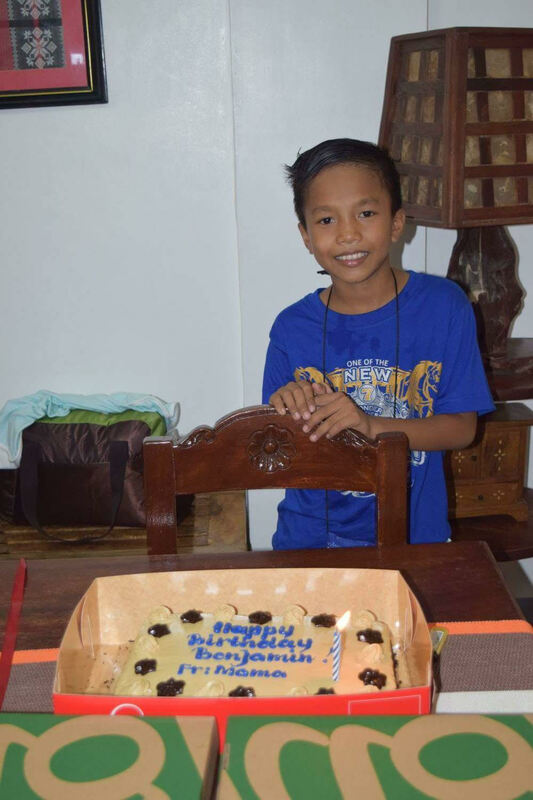 Rowena’s son, Benjamin, celebrates his birthday. Her experiences with both agents and employers have been uneven. For her first contract, Rowena’s stipulated duty was to care for an elderly parent; to her surprise, when she reached the household, she found that she was also expected to care for an adult man with mental disabilities. Rowena was neither equipped nor prepared to manage both duties. Being entrusted with the care of her elderly charge also soon took its toll. 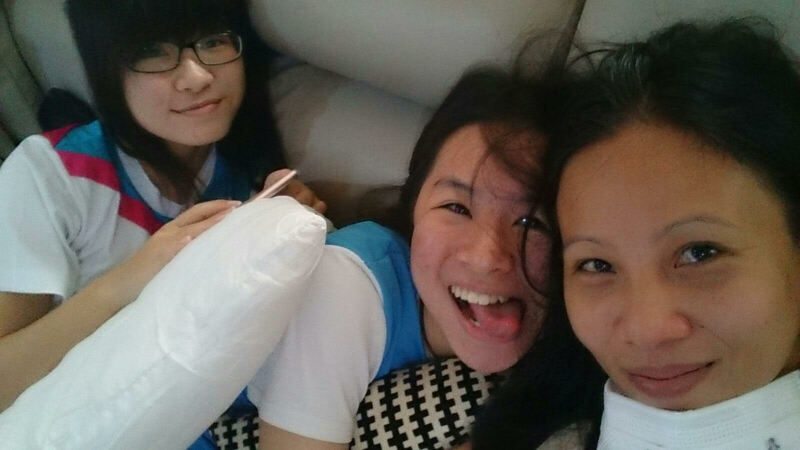 One night, the elderly woman attempted to navigate her way to the toilet herself, refusing Rowena’s assistance; as a result, she slipped, fell, and broke her hip, ending up convalescing at Tan Tock Seng Hospital for nearly three months. Instead, Rowena set up interviews with new potential employers on her days off — usually Sundays — and planned trips around Singapore to visit them at their homes. Rowena snaps a picture with the children from a previous household that she worked and lived with. She says that she still keeps in touch. Skipping the middleman also saved her money in transfer fees. “I paid SGD $50 to use Anisya for the first time,” Rowena says. “After that, the EZ-link card is the only thing that you will pay. It’s a lot of savings.” By law, conventional agencies are allowed to charge 1-2 months of a worker’s salary in transfer fees; this works out to SGD $500-$1000. But Rowena acknowledges that barriers to entry may be high for migrant domestic workers who value the simplicity, convenience, and added safety net of having an agent arrange their documentation and contracts. Embarking on independent job searches on a day off — not something that all domestic workers are entitled to in Singapore — requires significant investments in time and energy. Being able to use Anisya effectively also requires a familiarity with the norms embedded in professional hiring processes, such as informing employers if one is late to an interview, or being responsive to online enquiries. Despite this, Rowena feels that both the cost savings and the autonomy of being able to determine her own work conditions outweigh any inconvenience. Being able to meet workers in person and at home, and seeing how comfortable an applicant was with their dog, was also a crucial part of their search. The cost savings — SGD $400 for Anisya to process the paperwork, as the couple chose not to manage it themselves — in comparison to prices charged by agencies ranging from SGD $1500-$2000, were a boon. Their domestic worker, Carol, has been a good fit for them so far, and particularly enjoys the openness of the family’s home in the east, near the sea. A screengrab from Anisya’s hiring portal.